Governor Andrew M. Cuomo today toured storm damage in Putnam County and delivered a recovery update in response to several severe thunderstorms that occurred throughout Tuesday. At the height of the storm, over 200,000 utility customers were without power, mainly in the Mid-Hudson Region. The severe weather felled trees and power lines, damaged vehicles and homes, and resulted in at least two fatalities. As part of the recovery effort, the Governor has deployed 125 members of the New York National Guard and to further assist communities with recovery efforts. Currently, thousands of state and local personnel are on site in the affected areas with pre-deployed equipment to clear transportation corridors of debris and assess damage throughout the affected areas. The National Guard deployment began this morning with 125 members out of Camp Smith in Westchester County. They will be assisting state, county and local personnel with efforts ranging from debris clearance to traffic control. Currently, state officials from the Division of Homeland Security and Emergency Services, Department of Transportation, Department of Environmental Conservation, State Police, and Department of Public Service, have been deployed to the region to assist with recovery operations. 33 large generators from the state’s ten regional stockpiles have been sent to Dutchess, Orange and Westchester Counties to support traffic operations and power generation at key facilities in the region, as well as ten pallets of bottled water to Putnam County. Additionally, 125 members of the National Guard and 25 personnel from the State Office of Fire Prevention and Control and Office of Emergency Management are currently assisting localities with damage assessments and emergency operations support. A mobile command center is also en route that will be staffed by Department of Financial Services personnel to assist Putnam Valley residents with insurance claims. 558 DOT personnel are available for storm response in the Mid-Hudson Region and an additional 424 staff available for storm response in Sullivan County. In addition, the Department has deployed more than 120 maintenance staff and supervisors from the Capital Region, the Mohawk Valley, Central New York and the Southern Tier to help the region dig out from the storm, including four tree crews, 14 brush/chipper crews, and four traffic signal crews that have been deployed to the region to assist in recovery efforts. The following assets are prepared for deployment as needed: 386 large dump trucks, 102 larger loaders, 27 excavators, 23 chippers, 11 traffic signal trucks, 8 graders, 7 water tanker trucks, 5 vacuum trucks, 4 bucket trucks, one bulldozer, and one water pump. New York is committed to stepping up our preparedness and ensuring that all impacted New Yorkers receive the assistance they need to recover and clean up after the storm. Currently, New York State Thruway Authority maintenance crews are in the process of removing trees and debris from the shoulders of the Thruway system in the Hudson Valley region. The Thruway Authority stands at the ready to assist as called upon. New York's utilities have added 650 line, tree, and service workers to their existing base of 4,300 workers for restoration efforts. 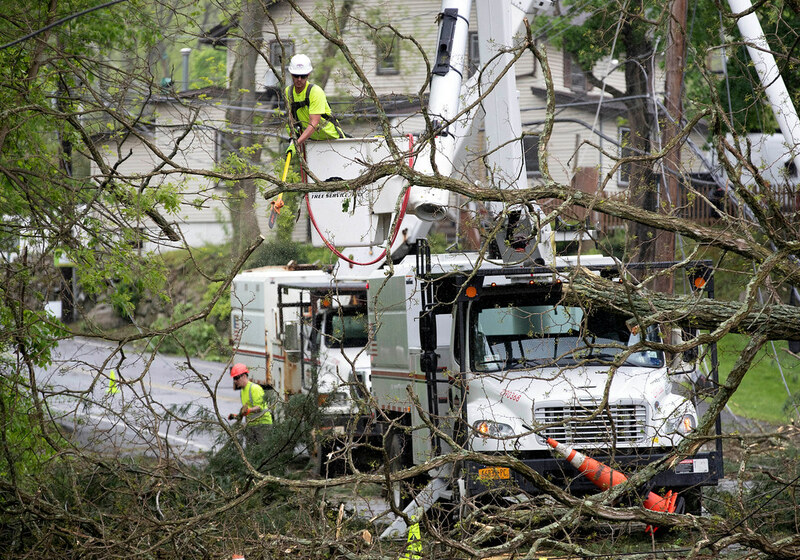 Crews are being moved to the areas that have had the greatest storm damage, including Dutchess, Orange, Putnam, Sullivan and Westchester counties. Department staff will continue to monitor the utilities' efforts during the storm restoration period. The Department of Public Service has extended Call Center Helpline hours starting today, Wednesday, May 16, until 7:30 p.m., to assist consumers in their storm restoration efforts. The Department of Public Service Call Center Helpline can be reached by calling 1-800-342-3377. Currently there are over 154,000 customers without power from the storm. DEC has assets pre-positioned to deploy to storm-ravaged communities in the Hudson Valley, including certified chainsaw operators, sawyers and sled teams, pole saws, generators, and light stands. DEC staff, including Forest Rangers and Environmental Conservation Police Officers (ECOs), are also pre-positioned to respond as needed. DEC has assessed campgrounds and State Lands in storm-impacted areas and staff are removing felled trees as necessary. Metro-North railroad forced worked throughout the night to clear more than 100 trees that had fallen across the tracks and repair third rail damage caused by fallen trees. Service has resumed systemwide with the exception of the northern Harlem Line between Southeast and Wassaic, which will resume this afternoon with the departure of the 3:43 p.m. train from Grand Central to Wassaic. NY-Alert is the state's free, subscription based, customizable, all-hazards alerting system. Alerts, such as important information regarding severe weather, can be emailed and also pushed to your cell phone via text message. To subscribe, visit the NY-Alert website at: www.nyalert.gov. For more information on NY-Alert, visit the FAQ page at: www.nyalert.gov/faq. New Yorkers should always avoid any downed power lines as they may be live and should be considered extremely dangerous.